I have enjoyed the Suikoden franchise for a good chunk of my life now, and have come to appreciate the series standards: 108 varied and colorful (if often throwaway) characters, no small amount of intrigue and diplomacy, a focus on large-scale battles and political or ideological change, and so on. Although the series has had its problems, even the worst Suikoden is a decent RPG with a few issues that drag it somewhat below the other games. The overall quality of the series has me eagerly awaiting any announcements, even in the case of the most recent entry/spinoff, Suikoden Tierkreis. Maybe it’s the fabled Orb of Knowledge, prize possession of an advanced ancient civilization and key to overthrowing the evil empire. Tierkreis breaks away from several of the series’ main ideas. Gone is the persistent storyline of the series, where each game takes place in a different region of an unimaginably large world, vast areas of which remain unknown. The True Runes, around which the series revolved, have been removed as well. 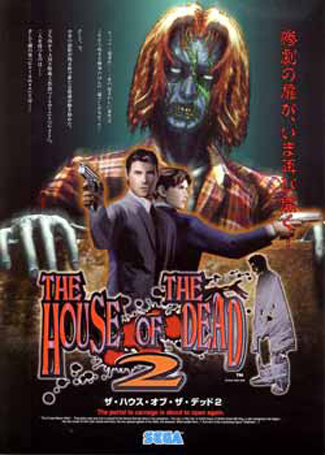 Also, this game breaks tradition by featuring a teenage male main character (just kidding – that’s business as usual). I will admit that it was with some trepidation that I bought and started up Suikoden Tierkreis. The in-game graphics look somewhat more blocky than FFVII, making Tierkreis yet another poster child for the “for the love of god, try making 2d games again” campaign. Rumors abounded that perhaps the game didn’t actually have 108 stars (actually a lie – Tierkreis not only has 108, it has the most playable characters in battle of any Suikoden). Battles were simplified, so that instead of the Rune magic system, there was a straight-up HP/MP system with equipable spells and abilities. What’s worse, Tierkreis makes the terrible mistake of allowing only four characters in battle rather than the standard six. With over 90 playable characters, who the hell is going to bother trying even half of them when you can only switch 3 in your party? What’s more, the plot begins with cliche after horrible cliche. The main character is the standard mischievous annoying teenager who has no parents. His adopted father is the town elder, whose wife died or perhaps never existed – but that’s not important, because the elder’s not an important character. Anyway, the hero goes on a monster hunt with his friends and comes across a strange relic that grants them mysterious powers. From there, they go on a quest to find out what the relic is. Fortunately, from there the plot picks up nicely as more mature characters take the stage from time to time. Although it takes several hours, gradually the characters become involved in the politics of a neighboring nation, and Tierkreis kicks into the Suikoden equivalent of high gear. The newly formed proto-nation of the main characters begins rallying various factions to oppose the big bad empire/church/etc, and you can recruit several dozen mostly inconsequential people on the way. Only the richest farmers live in castles. While the large-picture view of the story makes it seem pretty trite, it’s actually pretty good. Some plot twists were not only original, but completely out of the blue – mostly because a large part of the story is figuring out what exactly is going on. 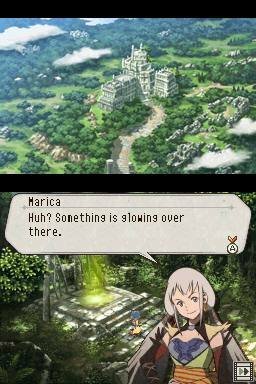 My main complaint with the game is the same problem I have with some of the other Suikodens, which don’t do it nearly as much as the standard JRPG: an over-reliance on magic as plot device. Once you start to beat your opponent’s armies in the field, they pull some magical artifact or another and say “ah-ha!” and then you start fighting monsters that appear out of nowhere. I suppose if they didn’t, you’d be stuck in a fairly uninteresting half-war half-RPG game, but it still pains me to see a game that revolves around diplomacy and statecraft rely on something so weak. With Tierkreis, I can forgive these mis-steps a little more since it is more fantasy-themed than its compatriots. Tierkreis is the first DS game to impress me with its production value. Don’t get me wrong; I enjoyed FFIV DS. I played through the first Phoenix Wright and it was a great set of stories. Both are pretty good as portable games go, but Tierkreis is the first game where I really wanted to play it over console games. Each character has several detailed portraits and many of the voices in cutscenes are well done. Some of the teenage characters are annoying, but all the rest of the characters are good – thankfully, for some odd reason all the teenagers speak very quickly. 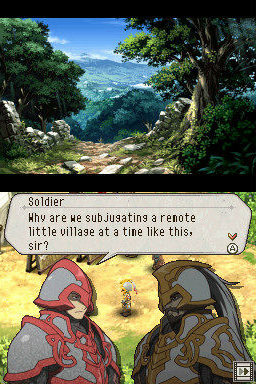 Each dungeon or town section is accompanied by a large depiction of the area on the top screen – although it sounds like an odd use for it, all of these scenes are really well-drawn. Finally, the music varies between outstanding and merely tolerable. 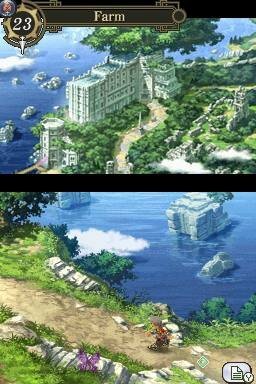 Parts are reminiscent of Chrono Cross and the better songs of the earlier Suikodens, but the main battle theme was bland and boring in comparison. Because we are the god damned empire, that’s why. I would be remiss if I didn’t mention the worst part of Tierkreis: the battle system is bland, uninteresting, and incredibly easy (with the possible exception of the final boss). Even boss fights can usually be beaten by mashing A (or using the auto-attack function). Unless you deliberately choose to use bad characters, you are not going to have any problems in the first 30 hours of this game (I completed the game in 35). Encounters are frequent and feel almost like a slap on the wrist for picking the wrong direction in dungeons. Unlike, say, Phantasy Star 2, where you would make a wrong turn and get attacked by horde after horde of angry hornets, in Tierkreis it is more like a few mosquitoes wander in and distract your party for 10 seconds – not difficult, but almost worse since it is both annoying and pointless. Currency isn’t obtained via battles, and experience is scaled so that you will usually be at a good level after 3-4 random encounters. I have no idea why Konami decided having so many random encounters would be a good idea, so I will complain about it here and hope they fix it next game, instead of actually being proactive or anything. Also, a second warning: Tierkreis has no suspend function. Save points are fairly frequent (you’ll find one every 10 minutes until the final sections of the game), but for you bus / metro riders out there, you may not make progress in a 5-10 minute game session. The newest entry (or spinoff) in the Suikoden series may not be a part of the main plotline, but it certainly has the Suikoden flavor. It’s an excellent story interrupted by dungeons with random battles. Tierkreis might not quite match up to the first few entries in the excellent series – but I think it’s about as close as you can get. What’s more, it’s portable. It figures that it would take so long for an RPG both original and good to show up on the DS – but I’m glad one finally arrived. Here’s hoping Konami’s willing to give Suikoden 6 – or, failing that, Suikoden Tierkreis 2 – a try.